Click the button below to add the Facial Cream #Natural Facial Cream# to your wish list. Only nutrient-rich plant butters and oils can break the cycle of dry skin. Let this luxurious facial cream illuminate your skin with a sheen that charms. More than just coating the top layer, the Facial Cream penetrates to hydrate, heal and soothe. Made with nature's lush moisturizing Shea and Mango butters to help repair, soften and renew skin. This facial cream is made fresh in the USA. 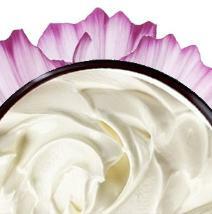 Firms and moisturizes for softer, smoother and more velvetier skin. Chia Seed and Red Raspberry Seed oils are vitamin-rich moisturizers. Aloe Vera moisturizes and nourishes dry skin to soften and smooth. Shea Butter is a nutritive moisturizer that provides antioxidants and vitamins to fight free radicals and prevent skin damage. 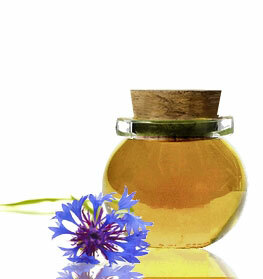 Chia Seed Oil rejuvenates and repairs skin for a refreshed and youthful appearance. Apply all over the face, ideally to just-bathed, barely dry and damp skin to seal in moisture. • Gently pat into the skin until fully absorbed. Aloe Barbadensis (Aloe Vera Hydrosol), Butyrospermum Parkii (Shea) Butter, Salvia Hispanica (Chia Seed) Oil, Rubus Idaeus (Red Raspberry Seed) Oil, Mangifera Indica (Mango) Butter, Cetyl Alcohol, Glyceryl Stearate, Simmondsia Chinensis (Jojoba ) Oil, Persea Americana (Avocado) Oil, Myrica Cerifera (Bayberry Fruit) Wax, Hippophae Rhamnoides (Sea Buckthorn) Oil, Citrus Sinensis (Orange) Peel Oil, Glyceryl Caprylate, Sodium Stearoyl Lactylate, Sodium Lauroyl Lactylate, Caprylyl Glycol, Glycerin, Punica Granatum (Pomegranate Seed) Oil. I LOVE THIS!!! It goes on so nice and smooth. It’s like whipped cream for your face! And it absorbs so quickly that there is no oily film. I cannot wait to try every single one of your products!!! This is the best face moisturizer ever!! I've been using it for about a year now, and my skin GLOWS. I've always had good skin, but his has made it near perfect. It moisturizes without feeling sticky or thick, and it smells so nutritive ly pure. My skin is so soft and smooth, and I no longer need to wear makeup!! I'd recommend this to anyone. I've only been using this for a week and it's already made a huge difference in my facial skin. It helps to moisturize the dry sections of my skin without leaving it oily. It's also amazing for acne; don't be scared of this if you have acne or oily skin...it really is for all skin types. I Love this facial cream. I have very dry skin and it feels amazing. What I love the most about this product is the fact that it does not leave a gross greasy oily residue on my face. When it dries, all you are left with is the feeling of your own skin, but better! And there is no fragrance that I notice which I also really like. I love this stuff! it's super light weight and doesn't leave my face greasy at all. It absorbs really fast. I have combination skin and it works great! I break out easily and this hasn't caused any break outs. Been using this facial cream for a little over a year now! Over the years I have purchased many different face creams and found them lacking especially with my older skin and living in a cold climate 6 months of the year but this product is wonderful. Love this product. I have tried a lot of expensive face creams over the past and they haven't worked this product works. This stuff really hydrates my skin - note a small amount goes along way! It does not leave your face feeling oily and it makes your skin so soft. I use this cream every morning before applying my makeup. Now that I have discovered this line I will not use any other product! I will be 60 in 6 months and want to keep my shin looking as young and healthy as possible. Love that the products are all natural. Try their products, you won't be disappointed! The only product that has worked! I love this product. The smell was very weird to me, as first, but now that I've gotten used to it, I enjoy it. Honestly, I purchased this because my forehead has been peeling and dry and crinkly (and I'm only 25). I have tried literally everything (coconut oil, jojoba oil, sunflower oil, fancy moisturizers, Burt's Bees, etc.) to try to get my forehead to stop flaking and looking so dry and old. I decided to give this a try and OMG. This makes my skin SO SOFT AND SMOOTH AND IT FEELS AMAZING. NO MORE flakes or dry skin. It makes my eyebrows super soft, too! My boyfriend even uses the product when his eyebrows start to get really dry and flaky, and it works instantly. I absolutely LOVE this product. I was apprehensive about trying this, but was so pleasantly surprised. My skin feels so nice, now. A little goes a long way with this. I use the anti-aging serum first, then this, then finish up with the eye cream. I love the fact that all of these products are natural and actually good for my skin. I've been using this cream for about 5 days now and it is just amazing! I really needed a moisterizing cream because my skin felt tight and was flaking in between my eyebrows. In just 2 days all that cleared up and I absolutly love this cream and the smell:) There was a lot more cream in the tub than I expected. Overall I am so happy with this product! Thank you!